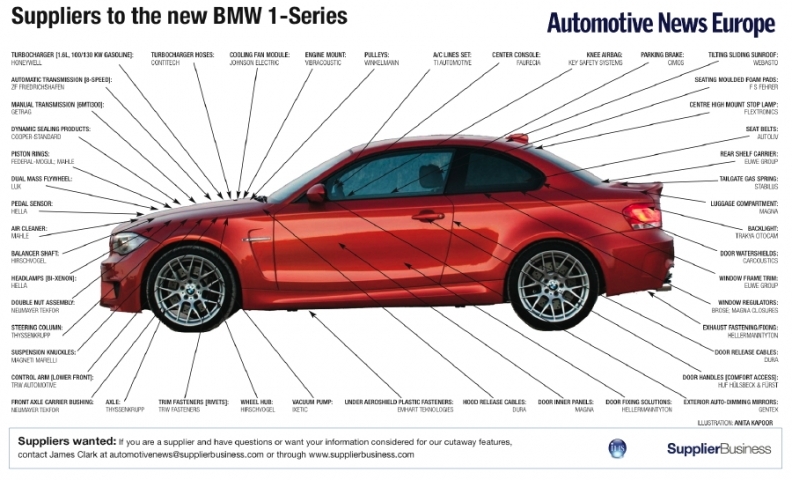 The styling of the new second-generation BMW 1 series has been altered significantly compared with the first generation of the compact car. BMW say the changes create a more sporty design. The new 1 series is 83mm longer and 14mm wider. Its wheelbase also has been stretched by 30mm to provide more interior space. The styling of both the front and rear of the vehicle is enhanced by the new-look front and rear bumpers supplied by Magna International. In addition to the bumpers, Magna also supplies various other components including the door inner panels, sun visors, rear quarter windows and various acoustic parts. Complementing the appearance of the front end are new headlamps, which are available in bi-xenon format and supplied by Hella KGaA Hueck & Co. The German partsmaker also supplies the 1 series with its headlamp cleaning device, the sensor for the automatic windshield wiper and lights function, various interior lighting components as well as a number of sensors located around the vehicle. Mahle GmbH provides the 1 series with its pistons and affiliated parts, such as rings and pins, as well as oil filter modules. The interior and exterior auto-dimming mirrors are supplied by Gentex Corp., while TRW Automotive supplies safety features such as the driver and passenger airbag modules and seat belt pre-tensioners. BMW produces the 1 series on its L7 platform at its plants in Leipzig and Regensburg, Germany. IHS Automotive forecasts that overall output for the 1-series model line will peak at 237,000 in 2013, up from a forecast of 182,000 unit in 2011.